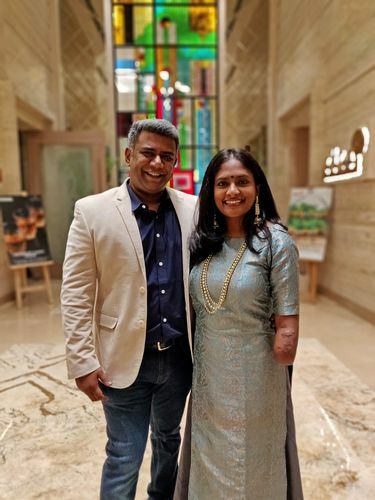 Through thick and thin: Shalini with her husband Prashant Chowdappa. Trauma brought us closer. We survived the toughest of storms, clinging to each other. That said, we give each other enough space. Sometimes, Shalu would say that at least one of us had to remain sane, and would encourage me to go out, just to freshen my mind. I wouldn't go far. I would catch up with friends for drinks somewhere close by, and return in a short while. It was depressing to see Shalu bedridden; her heart stopped beating, and her lungs collapsed. The doctors had a hard time rebooting her body. After five days, she came back to life. We had lost our baby by then. But the joy of Shalu being alive overpowered the sorrow, and helped me move on. We wanted to save her limbs at any cost. We tried everything, from ayurveda to ozone therapy. We prayed hard for a miracle. At times, she would show signs of improvement, but no treatment really worked. One of the most challenging parts of the recovery [from the amputations] was to remove the dead tissue from her limbs. The doctors had no way to identify if the tissue being removed was dead or alive, and would only stop removing it when she cried out in pain. At one point, her sister and I wished she had died. We wondered why we had prayed for her life, only to see her suffer so much. However, there were some funny and light moments, too. Once, while waiting to see the doctor, a lady in the waiting room kept staring at Shalu. After a while, she walked up to her and asked what had happened. “Dowry harassment,” said Shalu. “My husband and mother-in-law set me on fire.” I think Indians are the most curious people in the world. We think we have a right to know everything. On the day she went into hospital to get her legs amputated, Shalu startled us all. She had painted her toenails with a bright purple nail polish. “They might as well go out in style,” she said. With prosthetic limbs, Shalu got back to everyday life. It was not easy. Most public places in India are not disabled-friendly and that was a huge hurdle. Once, I took Shalu to watch a movie, and had to carry her up the stairs as the multiplex did not have wheelchair-accessible staircases. Despite plenty of difficulties, we try to lead a normal life. Who defines what is normal, anyway? For us, this is a normal life. As a caregiver, I didn't struggle much, as I found the right people at the right time. After Shalu fell ill, her parents moved in with us, and her friends provided much-needed support. While she was bedridden, we hired a nurse. She was always surrounded by positive people, and this helped tremendously with her recovery. Looking back, I feel this whole experience has made Shalu stronger. Those who hesitate to chase their dreams have a lot to learn from her. She has touched so many lives. I know suicide attempt survivors who have turned their lives around after meeting her. It has been a great journey. I am really happy for Shalu. My biggest worry is what will happen to her after I die. Prashant Chowdappa, Shalini's husband, is a director in a multinational company.